Researchers from the Eindhoven University of Technology and the FOM Foundation have made a breakthrough in developing a prototype solar cell that produces fuel rather than electrical power. The solar cell represents a new way to produce hydrogen fuel, which can be used by fuel cell systems to generate electricity. Finding new ways to produce hydrogen has become an important endeavor, as fuel cells begin to gain strong support in numerous industries. The prototype solar cell is comprised of gallium phosphide, which allows the cell to generate hydrogen from liquid water. 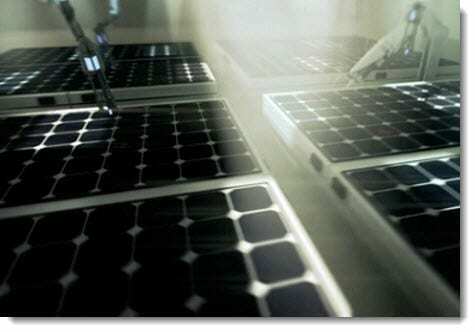 A relatively small amount of this material is used, which is ideal, as the price of the solar cell is quite limited when compared to other solutions. The energy generated by the solar cell is used to trigger chemical reactions, one of which is electrolysis, a process through which water is separated into its component parts of oxygen and hydrogen. The new solar cell could be good news for those interested in hydrogen fuel cells. These fuel cells need hydrogen to power their energy production capabilities. Conventional hydrogen production methods are somewhat expensive and inefficient, however, which has made fuel cells relatively unattractive. The solar cell has shown that it is able to produce hydrogen in a very efficient way, using nothing more than sunlight and inexpensive materials. As such, the solar cell may eventually become a very convenient and effective way to generate hydrogen and supply this fuel to the fuel cell sector. Efficient and inexpensive hydrogen production may make fuel cells more attractive to those interested in renewable energy. More testing must be done on the solar cell before it could begin entering use in a commercial sense, but researchers believe that the solution has a bright future ahead. As fuel cells gain momentum, solar energy is also beginning to gain attention as a way to produce hydrogen fuel in an environmentally friendly manner.